A graphene implant that detects brain activity at extremely low frequencies could improve the technology of the electrodes to analyze the state of our brain, has been developed by researchers from several research institutes of the CSIC in Catalonia and the CIBER-BBN. Last First of February , Rosa Villa, Scientific Director of NANBIOSIS U8 Micro – Nano Technology Unit was interviewed in Ágora, a program of Scientific Dissemination of Radio Aragón. Dr. Villa, researcher of the Biomedical Applications Group of the Institute of Microelectronics of Barcelona and CIBER in Bioengineering, Biomaterials and Nanomedicine, explains the relevance of the research carried out, together with several institutes of the CSIC in Catalonia, on the application of new materials to the study of brain activity. were analyzed used to be large; thanks to the microelectronics began to make increasingly smaller electrodes that could identify communications much better but that small size also makes their limited reach, since they do not always take all the degrees of frequency. Graphene has opened the degree of frequencies to detect the electrical signals of the brain. 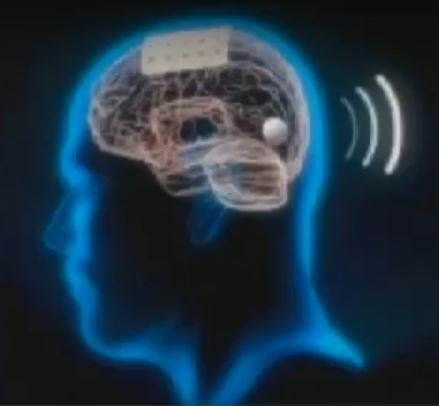 So far the electrodes were placed on top of the hair (for example the encephalograms) but now, although it has only been done in animals for the moment, the microelectrodes are already being placed as implants on the brain itself, which are left on the surface or they dig in to access more depth. When this is done, the brain feels invaded and isolates that electrode generating a scar, which is why more compatible materials are sought that are not rejected by the brain, such as graphene. Overcoming this technical limitation makes accessible the large amount of information that is below 0.1 Hz, while it facilitates the design of new brain-computer interfaces can register a wide range of frequency of what is occurring in a site of the brain. Eli Prats and Eduard Masvidal researchers of NANBIOSIS Unit 8 Micro and Nanotechnology Unit have shown their last results in ECoG recordings and biosensing using graphene based devices at the 8th edition of Graphene Conference series, the largest European Event in Graphene and 2D Materials, which is taken place in Dresden (Germany) from the 26th until the 29th of June 2018. 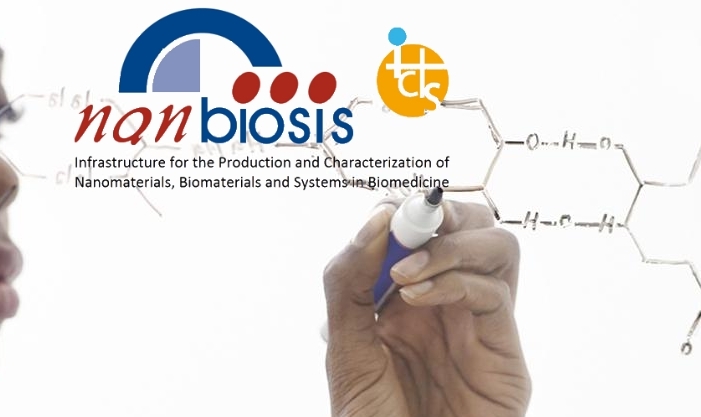 Scientists of NANBIOSIS Unit 8. Micro – Nano Technology Unit, led by Gemma Gabriel, Scientific Coordinator of the Unit, are the authors of the article “Online oxygen monitoring using integrated inkjetprinted sensors in a liver-on-a-chip system”, published by Lab on a chip. The demand for real-time monitoring of cell functions and cell conditions has dramatically increased with the emergence of organ-on-a-chip (OOC) systems. However, the incorporation of co-cultures and microfluidic channels in OOC systems increases their biological complexity and therefore makes the analysis and monitoring of analytical parameters inside the device more difficult. 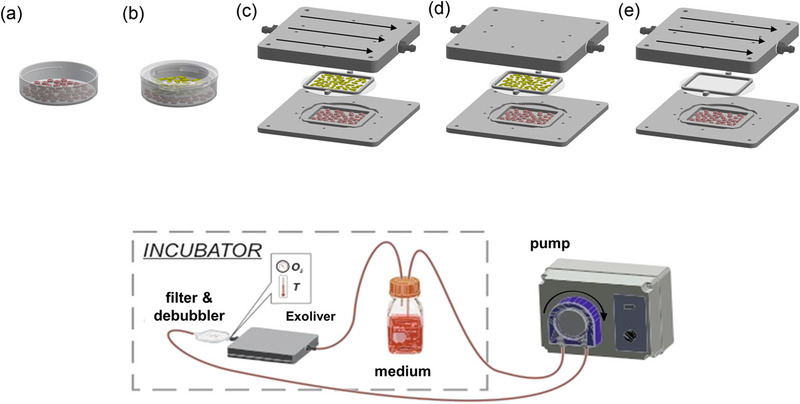 In this work, theauthors present an approach to integrate multiple sensors in an extremely thin, porous and delicate membrane inside a liver-on-a-chip device. Specifically, three electrochemical dissolved oxygen (DO) sensors were inkjet-printed along the microfluidic channel allowing local online monitoring of oxygen concentrations. This approach demonstrates the existence of an oxygen gradient up to 17.5% for rat hepatocytes and 32.5% for human hepatocytes along the bottom channel. Such gradients are considered crucial for the appearance of zonation of the liver. Inkjet printing (IJP) was the selected technology as it allows drop on demand material deposition compatible with delicate substrates, as used in this study, which cannot withstand temperatures higher than 130 °C. For the deposition of uniform gold and silver conductive inks on the porous membrane, a primer layer using SU-8 dielectric material was used to seal the porosity of the membrane at defined areas, with the aim of building a uniform sensor device. As a proof-of-concept, experiments with cell cultures of primary human and rat hepatocytes were performed, and oxygen consumption rate was stimulated with carbonyl-cyanide-4-(trifluoromethoxy)phenylhydrazone (FCCP), accelerating the basal respiration of 0.23 ± 0.07 nmol s−1/106 cells up to 5.95 ± 0.67 nmol s−1/106 cells s for rat cells and the basal respiration of 0.17 ± 0.10 nmol s−1/106 cells by up to 10.62 ± 1.15 nmol s−1/106 cells for human cells, with higher oxygen consumption of the cells seeded at the outflow zone. These results demonstrate that the approach of printing sensors inside an OOC has tremendous potential because IJP is a feasible technique for the integration of different sensors for evaluating metabolic activity of cells, and overcomes one of the major challenges still remaining on how to tap the full potential of OOC systems. Dra. Rosa Villa, Scientific Director of NANBIOSIS U8. Micro – Nano Technology Unit, explained last June, 11 at the Residence of Researchers of Barcelona the great scientific challenges in finding tools that allow a good interaction between the nervous and the artificial system. This talk is part of the series of conferences organized by the CNM with the theme “Why research in micro-electronics?” Dr. Manuel Lozano, Director of the CNM, introduced the talk explaining that with microelectronic technology scientists can capture the signals that occur in the nerves and in the brain and presented Rosa Villa as a doctor with a PhD in cochlear implants (electronic medical devices that perform the work of damaged parts of the inner ear (cochlea) to provide sound signals to the brain). Dr. Villa now directs the group of biomedical applications of the CNM that currently uses nano technologies in their research. Her training in medicine and microelectronics has allowed her to tackle electronic-based projects with biomedical application. Her lines of research are focused, nowadays, on neural interfaces and on organ-on-chip technology, (a multi-channel 3-D microfluidic cell culture chip that simulates the activities, mechanics and physiological response of the entire organs and organ systems, the group of Dr. Villa works mainly the liver, very useful for the test of drug patho-toxicity). In this talk, Rosa Villa explains her second line research of neural interfaces, the development of suitable interfaces between the biological systems and electronic devices and how they study the improvement of the necessary technologies to restore the motor skills or to know how the brain works applying microelectronic techniques. 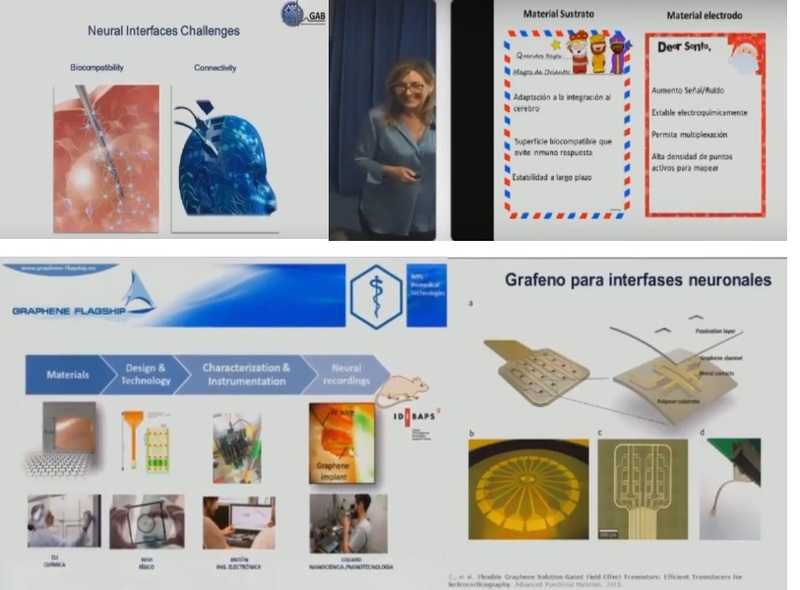 These investigations run into the main problems of biocompatibility and conectivity and Rosa Villa shows us her letter to Santa Claus to solve them and how graphene is being of great help. The video includes a funny class by Eli Prats to produce graphene at home. On May 16, scientists from two units of NANBIOSIS filled the pubs, not to talk about football but about science. In the cafe of the civic center of the Casa Orlandai in Barcelona, ​​Eli Prats, a researcher of NANBIOSIS U8. Micro – Nano Technology Unit, explains her group has developed graphene electrodes, a material with unique properties, that can monitor the activity of the brain in a less invasive than conventional ones. “We have tested it in rats and we have discovered that graphene can detect very poorly studied brain waves, which occur just before dying, just before an attack of epilepsy or before a migraine attack.” The researcher shows a sample of the tiny electrodes, which passes from hand to hand in the pub. “It’s still just an idea, but theoretically in the future these electrodes, placed on a person’s brain, could send a signal to a tablet and predict when they will suffer an attack of epilepsy,” adds Eli Prats. Esther Pueyo, researcher of NANBIOSIS, U27. High Performance Computing, in the Drinks and Pool Aranda pub of Zaragoza explained that “Chronological age does not matter, but the biological one does, not all hearts age equally” and she tried to answer the questions why do I look older? What other people of my age? Will this have consequences? To show the tiny tissues Esther and researchers around her commonly work with, biopsies were collected from a cow heart and examples of the experimental and theoretical analyses they conduct were illustrated. Throughout Spain, a total of 730 scientists have participated giving talks within the Pint of Science Festival, in 56 cities, together with around 400 organizers, all of them volunteers.